9 3/8 by 12 5/8 in. This newly discovered painting is one of only five known depictions of Venice from Corot’s first trip to Italy in 1828. 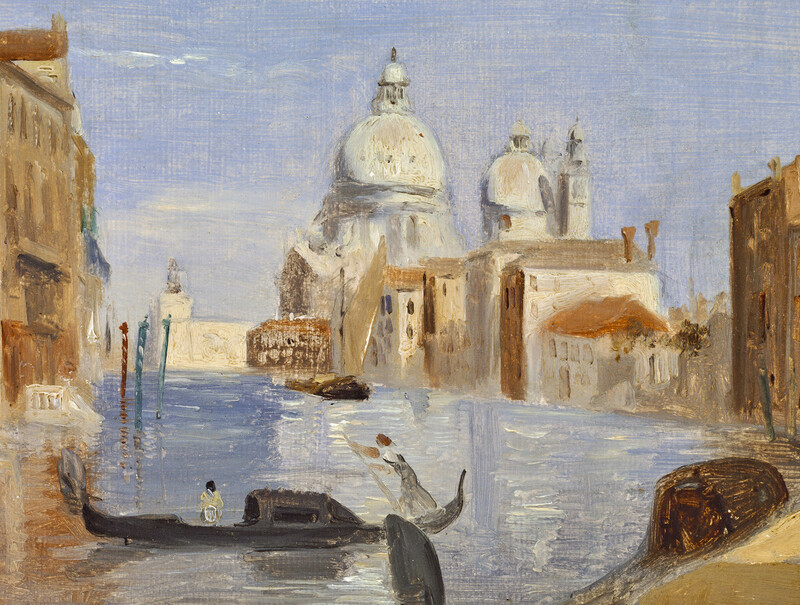 This newly discovered painting is one of five known depictions of Venice from Corot’s first trip to Italy in 1828. Robaut documented only two Venetian views from this period in his catalogue raisonné and according to Martin Dieterle, two additional Venetian subjects have since been identified with this work now representing the fifth known composition. Like most of Corot’s works from this first Italian trip, this painting is executed in a fluid plein-air technique – or a technique which Martin Dieterle likens to “drawing in oil”; the goal being to create a rapid “snapshot” of a specific location and time. The result is spontaneous and captures an immediate visual impression. The present work is inscribed in the same manner as many of Corot’s works from his first Italian trip, where he incised the location and date directly into the wet paint with the handle of the brush. Here, he documents that is is Venice on July 12 (12 Juillet). Corot's stay in Venice may have been cut short due to an outbreak of cholera. Nevertheless, he was able to capture the pearly light that bounced off the water, and the sunlit reflections on the buildings. When Corot returned to Venice in 1834, he revisted this earlier view and painted a second version of the Grand Canal from the same location (see Robaut 317 and Gallery 19C inventory). The authenticity of this painting was confirmed by Martin Dieterle in 2004. It will be included om the sixth supplement to Alfred Robaut’s l’Oeuvre de Corot currently being prepared by Martin Dieterle and Claire Lebeau.